Electric President's sophomore effort is another modest electronic album made for rainy days spent in bed. 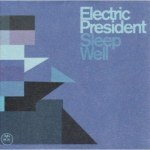 Electric President's sophomore effort is another modest electronic album made for rainy days spent in bed. On Sleep Well the duo, Ben Cooper and Alex Cane, blend the erratic beats of Telefon Tel Aviv with The Postal Service's gentle, sincere vocals for an album that does its job without reaching for the stars. A self-proclaimed "middle of the night record," it lulls you to sleep with lush soundscapes on "Monsters" and "We Will Walk Through Walls", which is both haunting and beautiful. Just as you nod off, however, apparitions appear when "Bright Mouths" and "Graves and the Infinite Arm" hum and then crash through your headphones. Then there's "All the Bones", which mashes Explosions in the Sky guitars with electronic drums and falsetto vocals for one of the album's best. The various moods portrayed across Sleep Well make for a solid listen sure to keep your attention, even though everything feels a bit safe.